ProAc Studio 118 review | What Hi-Fi? Look at Lionel Messi. Universally regarded as one of the best footballers on the planet, yet, with his short stature, sizeable conk and schoolboy haircut, he’s otherwise about as ordinary-looking a chap you’re likely to see this side of a geography classroom. We’ll let you fill in the blanks before this metaphor becomes even more laboured, but the point we’re trying to make is that you underestimate the ProAc Studio 118 speakers at your peril. Give these standmount speakers a bit of space, the offset tweeters on the inside and angled slightly towards the listening position, and around 24 hours to run-in and you’ll know what we mean. Physically, the only noticeable difference between the Studio 118s and their predecessor, the 115s, is the mid/bass driver. This now has a phase plug – a sort of extension of the pole piece that helps control dispersion – that makes the unit look like a wooden boy who told a lie. There’s a bit more work gone on underneath, including a new magnet assembly geared toward better bass response – evidently a priority for ProAc’s engineers. You feel it from the first thud of Radiohead’s 15 Step, but equally apparent is that they’ve surrendered no clarity as a result – especially if you make use of the option to bi-wire. In the wrong hands this track’s polyrhythm can sound like an injured crab tripping over a boiled-sweet wrapper, but the Studio 118s manage to make sense of it all. The amalgam of electronically filtered thumps, scratches and scrapes time perfectly and it’s as though they’ve each been given their own shelf from which to sound. There’s detail of which Vermeer would be proud; you can hear the musician as well as the instrument, and the vocals have the natural sound of a live recording. Where We’re Going, from Hans Zimmer’s Interstellar OST, showcases the dynamic range. The Studio 118s are delicate as the texture builds, following the complexities of each part intimately as they rise and settle. You get the feeling that, given a blank score and these speakers, you could fill in the dynamics yourself. ProAc says the Studio 118s handle all genres excellently, and it’s difficult to argue. They follow the story of The Streets’ Blinded By The Lights: there is real oomph in the kick, the snare snaps and the synthesizer’s out-of-time tremolo gives it all that off-kilter feel of being slightly spaced and paranoid in a club. Still, there is enough space to express the vulnerability in the vocals; that honest, almost confessional, Mike Skinner tone. Compared with the subtler ATC SCM11 speakers, the 2014 What Hi-Fi? 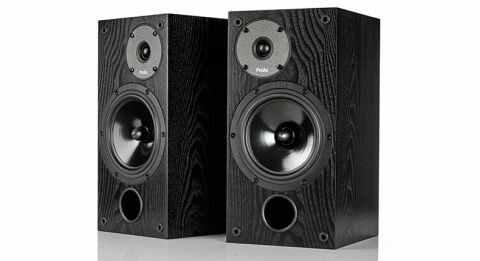 Award winner in this price bracket, you immediately notice how much livelier the Studio 118s are. In the end it becomes a question of preference, rather than quality, but our only word of warning would be to take care when matching. Bright-sounding kit could easily cause the 118s’ excitable temperament to rub you up the wrong way. Give them something that’s tonally balanced, dynamic and not afraid to put on its dancing shoes (Rega’s Elex-R amp, say), and you’ll reap the rewards. The 20mm tweeter sparkles, but pairing these speakers with too bright an amplifier could tip that top end just the wrong side of annoying. Take just a bit of care, however, and you’re bound to have a lot of fun.